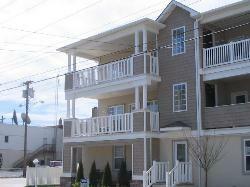 This brand new condominium is a top floor end unit on 122 E. Pine Ave. in Wildwood. 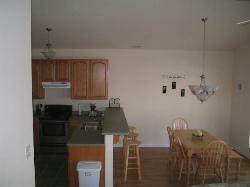 It is a new and fully furnished condo that features a covered deck in the front and at the rear. It has hardwood floors, stainless steel appliances, breakfast bar and a cathedral ceiling in the living room/dining room. There is a queen bed with dresser and nightstand in each of the back bedrooms which includes the master bedroom, and two twins in the front bedroom. The master bedroom has a private bathroom. There is also the convienience of your own two car garage with a private storage room for bikes, beach accessories, etc. It is located 1/2 block from the newly renovated Pacific ave. and 2 1/2 blocks from one of the top beaches at the Jersey Shore. And the beach is free! Also just a few blocks away is the famous Morey's Pier with lots of rides, shops and the largest waterpark on the boardwalk. We hope that we can assist you in your vacation at the Wildwoods which consists of what we believe to be, the finest beach, boardwalk, waterfront restaurants/fine dining and nightlife at the jersey shore. Security Deposit: $200 weekly and $100 for weekend stays. 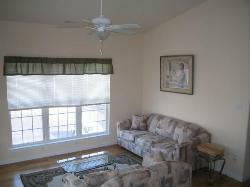 We rent to families and groups over 25 yrs. of age. Within a few blocks Morey's Pier, Shamrock and Fairview Cafe, Tuckers Pub, Alfe's Restaurant, Rite Aid, Wawa, Boardwalk shops and rides.